TSS PRO 200 was developed for protecting and weatherproofing extremely porous stone (limestone, sandstone, moss rock), concrete, masonry, stucco, cast stone, mortar grout joints, plaster and other very porous substrates. NOTICE: This product is VOC Compliant. Consumers in VOC regions of AZ (Maricopa County), CA, CT, DE, IL, IN, MA, MD, ME, NH, NJ, NY, OH, PA, RI, VA (Northern), VT, Washington, D.C., and Canada CAN purchase only 1-quart bottles of this product. TSS200 is a quality sealant designed specifically for extremely porous stone, masonry, concrete, plaster, and other very absorptive surfaces. Do not use on dense stone such as granite, marble, quartz etc. TSS200 protects against salt water erosion and water-based staining, while simultaneously weatherproofing and protecting surface to which it is applied. It is a user friendly, fast curing silicone-based sealant that infiltrates deep into the surface, protecting natural stone, grout, concrete and masonry surfaces. Once applied, TSS200 forms a molecular connection with the surface material, forming a powerful, water resistant bond which will act as a lasting barrier against water, pool chemicals, basic acid washing, salts, and other minerals found in water. TSS200 will slightly darken to darken – enhance – most stone. If applied on travertine it will darken and enhance the travertine (excess sealer not absorbed must be wiped off). What Type of Stone Does TSS Pro-200 Stone Sealant Work Best For? The TSS Pro-200 High Performance Sealer is a one-of-a-kind sealer that offers unique and long lasting protection. This heavy duty, solvent-based sealer is specially formulated specifically for porous stones. Totally state-of-the art, it contains high actives, and offers high performance, deep-penetration, and a long lasting sealer guarantee. Not only will TSS Pro-200 High Performance Sealer provide your stone with the protection that it requires from the elements, but it will also add a slightly darker color to the stone, emphasizing the stone?s rich and vibrant color. 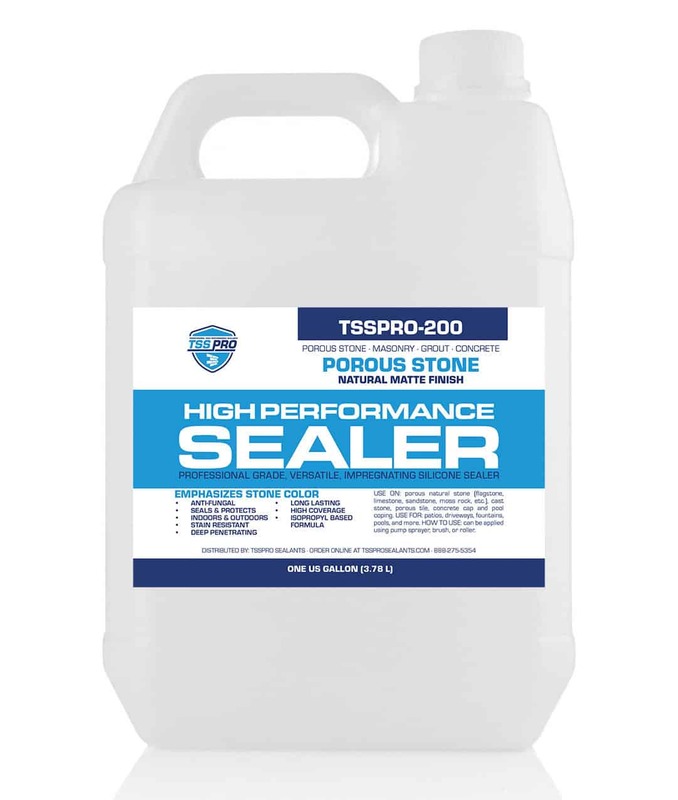 As mentioned above, the TSS Pro-200 High Performance Sealer is specially formulated specifically for porous stones. Examples of porous stone that the TSS Pro-200 High Performance Sealer is ideal for include limestone, sandstone, moss rock, and most flagstone. Depending upon your experience level regarding how to apply sealer to stone, you can apply the TSS Pro-200 High Performance Sealer yourself using a pump-up sprayer, brush, or roller.